IKEA has launched a new campaign, titled “The Morningmorphosis,” which aims to highlight that, thanks to its products, you can be the morning person you’re not. One of the spots features Kate, a woman who wakes up in the morning and finds her husband, Joe, bringing a big breakfast to her, in bed. A big pile of pancakes, a plate with scrambled eggs, a plate with a pile of sausages, a bowl of fruit, a glass of orange juice, and a jar of coffee are all on a breakfast wooden tray, brought in bed by Joe. 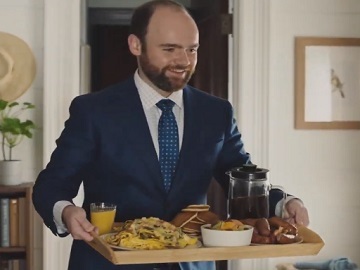 “Now, that Kate and Joe have been sleeping on an IKEA mattress (according to the ad, it’s the HAUGSVAR King mattress, priced at $549), Joe’s suddenly into making everyone’s morning easier,” the voiceover says, while on screen Joe is seen carrying the breakfast tray. He tells his wife that he also made the kids’ lunch and a big steak for himself, a steak that’s good. “Make the dream yours” an onscreen line reads at the end of the spot, while the voiceover says the tagline “Be the morning person you’re not”. Other ads feature Ron, a guy who makes sure he’s on time to face his sadistic strength trainer by using an IKEA dresser that helps him organize equipment, Lisa, a wife and mother who gets dressed in the morning without turning into a human alarm clock thanks to her organized IKEA wardrobe and its soft closing doors, and Sarah, a young woman who’s been sleeping on a new IKEA mattress and is waking up refreshed, without the need of washing her hair.